Our building on the square…which dates from sometime in the late 1800’s, was doctors’ offices upstairs, and a pharmacy and soda fountain downstairs. Near as we can tell, it has always been so, until sometime in the 1940’s when the offices upstairs were abandoned and just used for storage (we arrive at that date by the dates of various papers/etc that were stored up there). Think about that…a pharmacy continually in business at that location for over 100 years. A couple areas upstairs were briefly used after 1940…we know the “pool room” with the 1960’s pool table, Naugahyde and stud upholstered furniture etc was some sort of VERY interesting place…and there was an attempt at an antique store up there a few years back…but for the most part it’s simply been collecting junk. 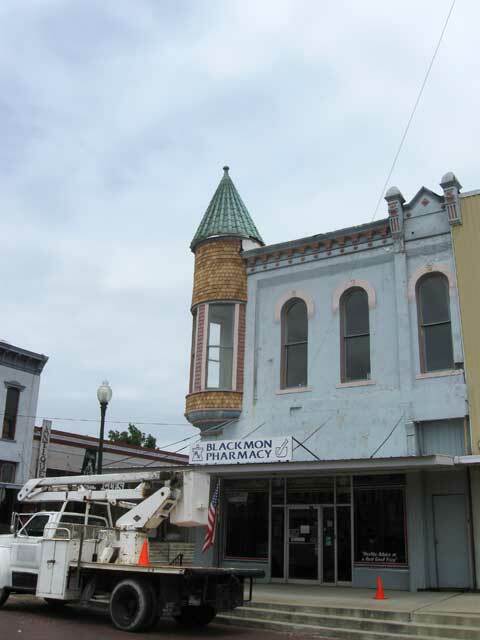 Our historic building on the Clarksville Square...a work in progress. 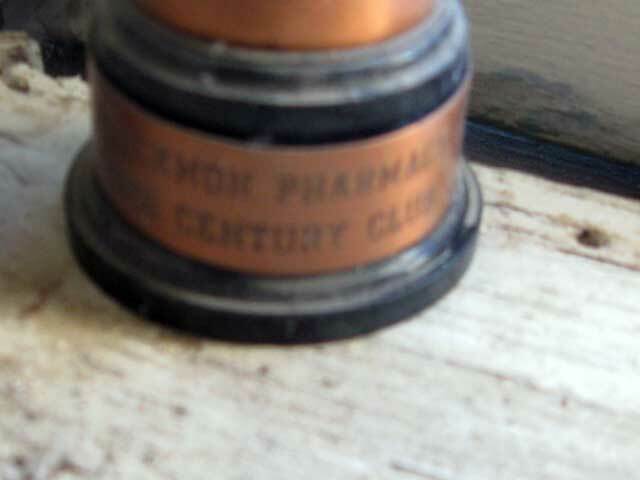 An interesting note is that we found a “Century of business” trophy issued to Blackmon Pharmacy in 1966…which indicates the building was built in 1866…which is a bit earlier than I expected, but easily probable…as Clarksville was founded in 1833. The Blackmon Pharmacy. 100 years in business in 1966. It’s sort of humbling…rather an odd feeling…to own a building that was likely standing (and doing business) at the end of the Civil War. While it’s easily possible that it was built later, there are elements to the building…”old west stuff”, things like the type of mortar and bricks, and hand wrought square nails) that indicate it could not be much later. Certainly earlier than 1900. It is definitely older than the Old Vic. The soda fountain ceased in the 1970’s sometime we think (locals still remember and may correct us on this) but the Pharmacy continued until October, 2009, when they moved to a new building (with a drive through). So, yeah, Blackmons is still in business…some 140 years now. 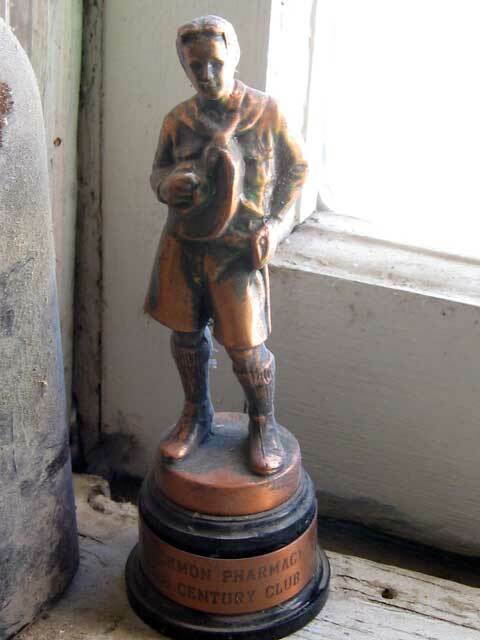 Anyway, we are busy cleaning out the 60 years of stuff (and dust) that accumulated upstairs. Mostly junk that nobody knew what to do with…probably close to a thousand pounds of pigeon crap…but some interesting stuff nonetheless. Here’s one of the doors. The door dates to the construction of the upstairs offices…the name? Well, I’m not sure when it dates from. Dr. G.E. 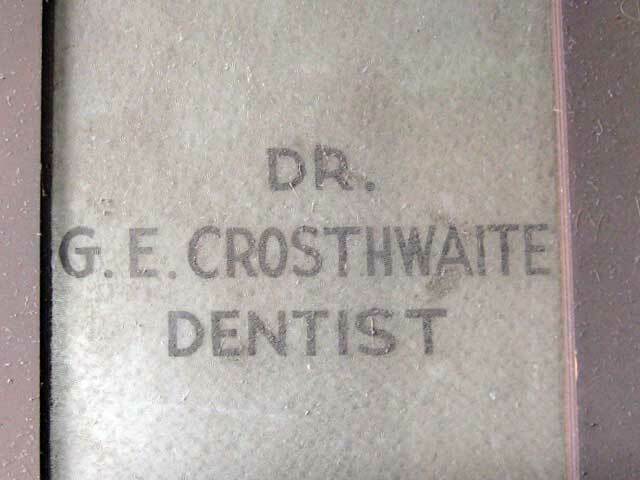 Crosthwaite, Dentist. The door dates from the late 1800's. Not sure about the name. A quick search on the ‘net says there’s a Dr. G.E. Crosthwaite III DDS that’s a practicing dentist for 40-some years, currently located in Sherman, Texas…which is just under 100 miles due west of here.